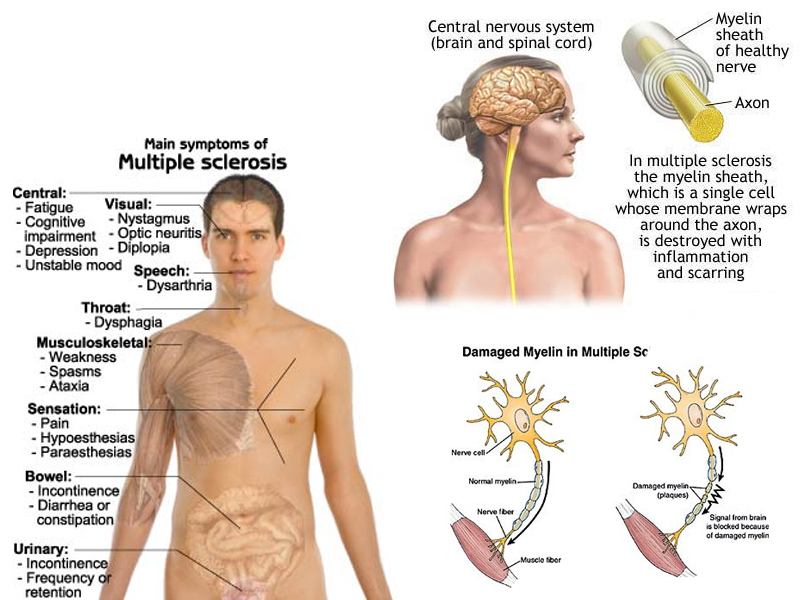 Multiple sclerosis (MS) is a an autoimmune disease of the central nervous system (brain and spinal cord), where the body’s immune system attacks its own myelin. As a result, it causes neurologic dysfunction such as sensory loss and mobility impairment in activities of daily living. Young adults (20-50 age) and female are most commonly affected by this disease. Patients who have multiple sclerosis (MS) symptoms can recover but the degree of recovery may vary and occasionally there may be an episodic flare-ups of the symptoms. Chiropractic focuses on the nervous system and correcting vertebral subluxation by spinal adjustments (especially upper cervical) can aid in better nervous function in individuals with MS, who already have compromised nervous system. Chiropractic adjustments, proper nutrition, and regular exercise has been known to suppress symptoms of multiple sclerosis. Other additional treatment options such as bracing and stretching should be considered after examination and consultation with your chiropractor at Chiropractic Concept of Bellevue.